Hey, there! It's Lynnea! And guess what?! I have another Christmas card to share with all of you! I know I can't get enough Christmas inspiration this time of year! 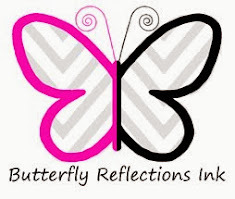 I'm using the cutest set from Neat & Tangled and you can get it for yourself in the Butterfly Reflections, Ink Shop! I started with a white card base and did some Distress inking with Wilted Violet and Seedless Preserves. I made the inking darker at the center and lighter on the edges. 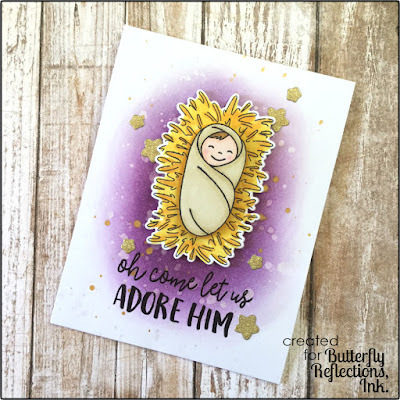 I stamped out my manger from the Little Baby Jesus stamp set from Neat & Tangled twice using some Memento Tuxedo Black ink and colored the images in with various colors of Copic markers. I used the matching Little Baby Jesus Dies to cut out the manger, but I fussy cut the actual baby right up against the outline edge. As a final touch to my card base, I flicked on some gold paint and some water mixed with Perfect Pearls. 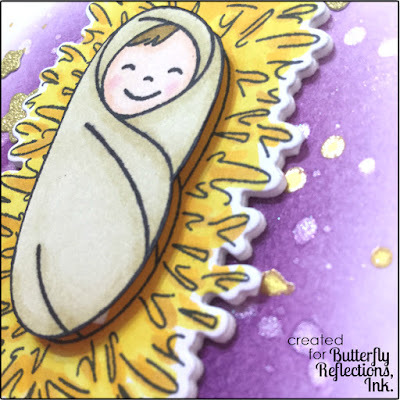 I used the coordinating dies to cut some stars out of gold glitter paper and glued them around the card. I stamped the sentiment with black ink and I popped both the hay and the baby on my card with foam tape. That's it! So simple, but I love it! Thanks for joining me! Remember to pick up this set in the shop! Until next time!